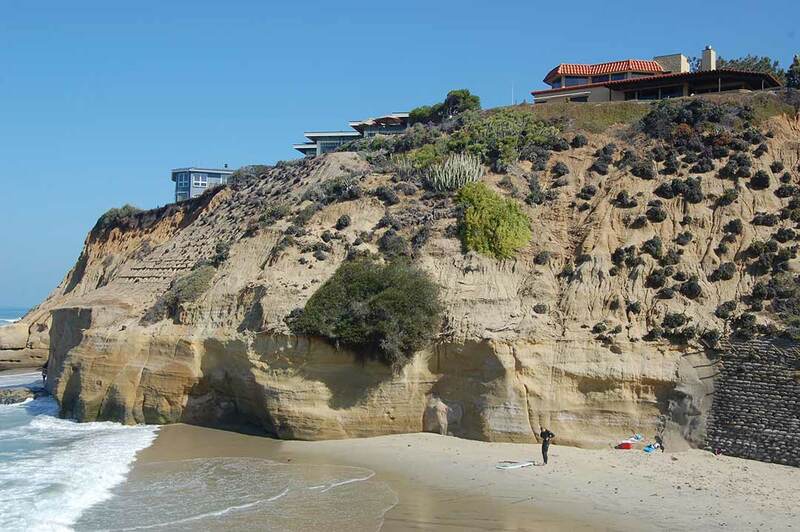 SOLANA BEACH — After experts confirmed that two cliff-top homes are in imminent danger of falling onto a heavily used beach and into the Pacific Ocean, council members at the March 23 meeting approved permits to build a sea wall to protect the structures and the public. The houses sit a few yards from the edge of a fragile bluff above Tide Beach Park and a popular nearby surf spot in the north end of the city. David and Sherry Winkler bought their home on Pacific Avenue in 2001 and moved in two years later. It currently sits about 8 feet from the top edge of the bluff. David Winkler, an attorney, said he conducted a lot of research before buying the single-story home and was convinced local and state laws would allow him to protect his investment. What he didn’t anticipate, he said, was sea level rise, El Niño storm conditions and just how fragile the bluffs are. “David and I hope to live there the rest of our lives,” Sherry Winkler said. 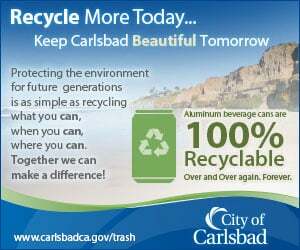 “We love Solana Beach but we worry about our home and the vulnerable bluff below. The Lucker residence, also on Pacific Avenue, is approximately 18 to 20 feet from the edge of the bluff. As a result of previous failures below both homes, which were built in the mid-to late 1950s and remodeled since, sea walls have already been built. The new structure between the two houses will be 140 feet long, 32 feet high and at least 18 inches thick. The outer 4 inches of a 12-inch sacrificial concrete covering will be sculpted, colored and textured to match the natural look of the coastal bluffs. Sea walls have become controversial in recent years. Bluff-top property owners say they are necessary to protect their homes and beachgoers below. Environmentalists say they prevent natural erosion and thus the creation of new sand to maintain beaches. Much of Solana Beach’s 1.7-mile coastline is already heavily armored. The sea wall will cost the Winklers and Luckers more than $1.4 million, plus mitigation fees for the loss of sand and public beach. Winkler said the costs are “disconcerting” because he has pulled his portion of the bluff retention device off the public beach so it will be built entirely on his property. He said the structure will increase public safety and the recreational beach area. He will, however, receive a $37,000 credit for the 230 cubic yards of sand the project will put on the beach. She said the city should have considered buying and removing the properties. “Where is the discussion of this alternative approach?” she asked. “When are we going to get serious about how we can halt the destruction of our beaches with sea walls and start protecting the public’s right to beach access through acquisition of bluff property? “Why must the default always be the short-term solution to build a sea wall that protects private property at the expense of public beach?” Brinner added. The subject of property acquisition has been discussed by city officials, but Mayor David Zito said there are currently no mechanisms in place for the city to buy the homes, which according to Zillow are worth a combined total of about $13.5 million. According to calculations from two different geotechnical consultants hired by Winkler, Lucker and the city, the existing static and seismic factors of safety are between .87 and 1.17. A factor of 1.0 or less represents a slope that is structurally failing, putting any bluff-top structure in “imminent danger” from potential collapse, the staff report states. “Based on your examination and study and calculations and conclusions, how imminent is imminent?” Councilman Peter Zahn asked. “You’re going to lose somewhere between 40 to 50 feet of bluff in the next 75 years,” Jim Knowlton, the city’s consultant, said. “You could lose it in 75 years really slowly or you could lose it tomorrow. Hopefully that is not the case. Council allowed the applicants three years to build the sea wall because it still needs to be approved by the California Coastal Commission. Even if that were to happen quickly work would still be months away because Winkler said construction on the beach is prohibited from Memorial Day to Labor Day. “That’s very disconcerting because we live with the fear every day that the bluff will collapse,” he said. “We hope it doesn’t fall on anyone. He noted that bluff erosion provides only about 2 percent to 5 percent of the amount of sand needed for a healthy beach. “So stopping sea walls is not going to restore the beach,” he said, adding that the structure will increase the recreational area by making it safe. Knowing what he does now, would he have purchased the home 15 years ago?